Greetings and thank you for your interest in Incarnation Parish School. 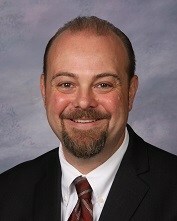 My name is Dr. Colby Boysen and I am the proud principal here. We are a Catholic school community dedicated to growing in faith and love and pursuing academic excellence. As you browse our site you will learn that this community of learners are diverse, joyful, competent, balanced, and caring. Our holistic approach to learning starts in preschool and culminates in the eighth grade. dedicated and qualified teachers in every room including specialists teaching music, art, science, Spanish, PE, computer and library skills. and a community of graduates who are admitted into and excelling at the very best Catholic high schools in the area; graduates who are prepared for high school, career, and heaven. You will see as you explore our site and walk our halls that Incarnation Parish School is a very special place. A place where all are valued and all are focused on faith, learning and community. A place where our students, parents, teachers and staff have HEART. A place where we hone our skills and grow in the knowledge of the Lord and this incredible world that we share. If you are just beginning to learn about our school community I invite you to explore our website and encourage you to come visit us in person. If you are already a proud member of our community you have undoubtedly experienced just how special this place is. Again, welcome and I look forward to learning and growing with you.